Stamm not only appreciates the machine technology though, but also the excellent service and long-standing cooperation in close partnership, which is currently manifesting itself again in a joint development project. The German-Austrian machine manufacturer is also pleased about the good cooperation: “Bänninger is just now developing together with us a highly innovative PP-R pipe on a 7-layer pipe extrusion line which we have supplied and recently installed at the Stassfurt production facility. This is an exciting project with a number of highly innovative aspects, involving an enormous increase in expert knowledge for Bänninger as well as for ourselves”, Heinrich Dohmann, Head of Mechanical Engineering Pipe Heads at battenfeld-cincinnati, comments. 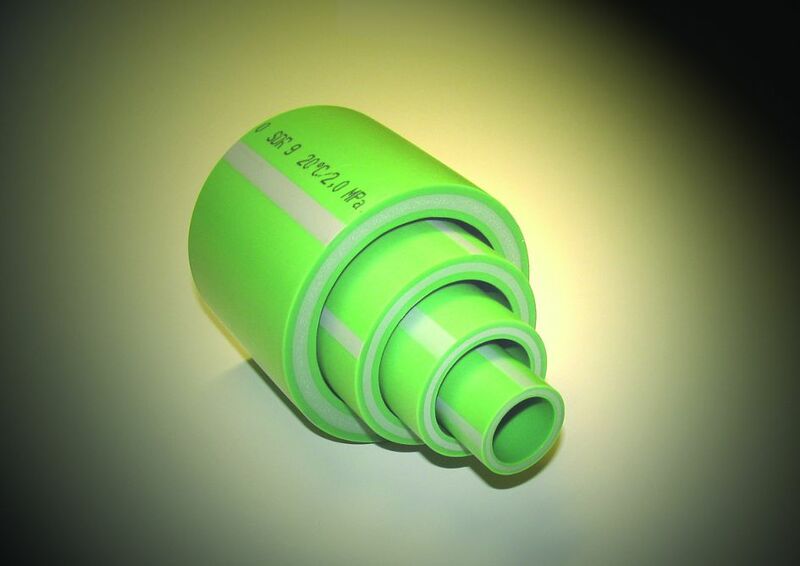 Bänninger is well known as an innovative and reliable company in the field of PP-R pipe production. These pipes, manufactured from a special polypropylene random copolymer, are mainly used for transporting hot and cold drinking water and for heating systems. Additional applications are found in apparatus and plant engineering, in greenhouses and rainwater harvesting. Like all pipes made of plastics, PP-R pipes stand out by their durability, excellent resistance to corrosion and easy laying properties. But thanks to their high molecular weight and thermal stability, PP-R pipes are particularly sturdy and resistant to heat, chemicals and pressure. PP-R pipes made of a special compound can even be produced with thinner walls than conventional pipes. “We have been using the new PP-RCT compound from Borealis since 2005. 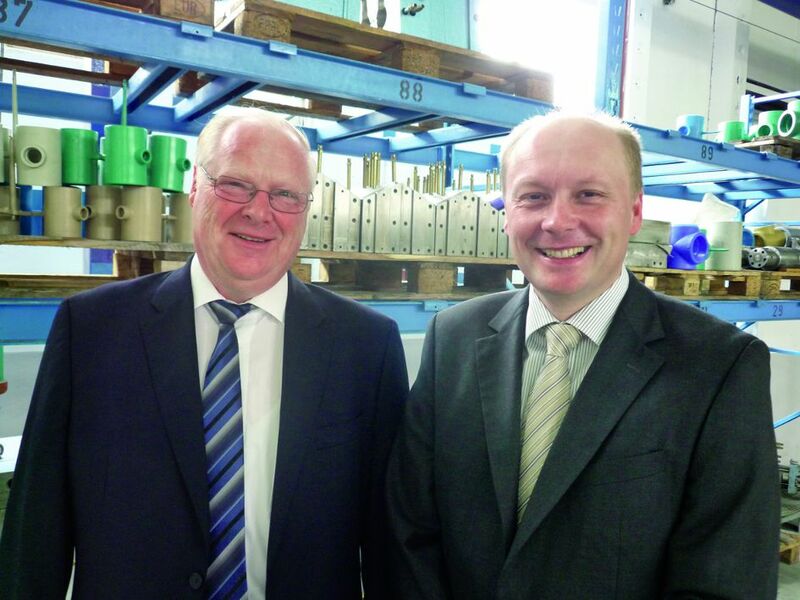 It allows material savings of 17% compared to the types of material we have used previously, and the pipes have been approved for a higher pressure class as well, in spite of their thinner walls”, Stamm explains the benefits of the material used by Bänninger, who is the only producer of PP-RCT pipes in Germany. Thinner walls with the same outer diameter also offer a 17% increase in the flow volume together with a reduced sound level. The mechanical strength of PP-R pipes can be further improved significantly by incorporating a glass fiber reinforced middle layer in multi-layer pipes. “We are currently producing about three quarters of all our pipes with glass fiber reinforcement”. Conventional “stabi” composite pipes could be entirely replaced by glass fiber reinforced pipes, as their longitudinal thermal expansion rates are almost equal. Stabi composite pipes have comparable properties, thanks to their aluminum layer, but they are much more difficult to connect, since the outer layer must be peeled off at the joints first in order to do so. By contrast, glass fiber reinforced PP-R pipes can be connected with each other by socket welding following simple, short heating-up. The crucial advantage in laying glass fiber reinforced PP-R pipes is that they have an extremely low expansion coefficient. Thanks to their high stability, the distance between clamps can be increased compared to conventional plastic pipes, which saves both fastening clamps and labor. Bänninger Rohrleitungssysteme GmbH is a 100% subsidiary of Bänninger Kunststoff-Produkte GmbH in Reiskirchen. For more than 20 years, these companies have been manufacturing complete PP-R piping systems, but also PVC and PE pipe couplings. In addition to the pipes, the complete systems include all types of fittings, fixtures, pipe tooling and other accessories. “In the production of our systems, we pay special attention to highest quality standards and therefore manufacture all components from a single source. Our real net output ratio is currently about 80%”, Stamm proudly explains. In practical terms, this means that Bänninger starts, for example, the production of connection thread fittings with metalworking and produces the threaded components in its own turning facility, which then become part of a fitting at the in-house injection molding facility. “We use exclusively red bronze in drinking water quality. It is more expensive than brass, but also significantly more durable and absolutely free of stress corrosion.” To produce the various fittings and accessories on 18 injection molding machines, Bänninger uses custom-made molds which are optimally adapted to the application. As material for the middle layer in multi-layer pipes, Bänninger uses a glass fiber reinforced compound which a compounder makes to its specifications on an exclusivity basis. For the actual pipe production, the company operates four extrusion lines of different sizes, with capacities ranging from 1,000 to 6,000 t/a, on which pipes with diameters from 16 to 400 mm are produced. 80% of the pipe systems manufactured are exported, primarily to Saudi Arabia and other Middle Eastern countries, to North Africa, for example Morocco and Tunisia, and Latin America, e. g. Argentina and Brazil. 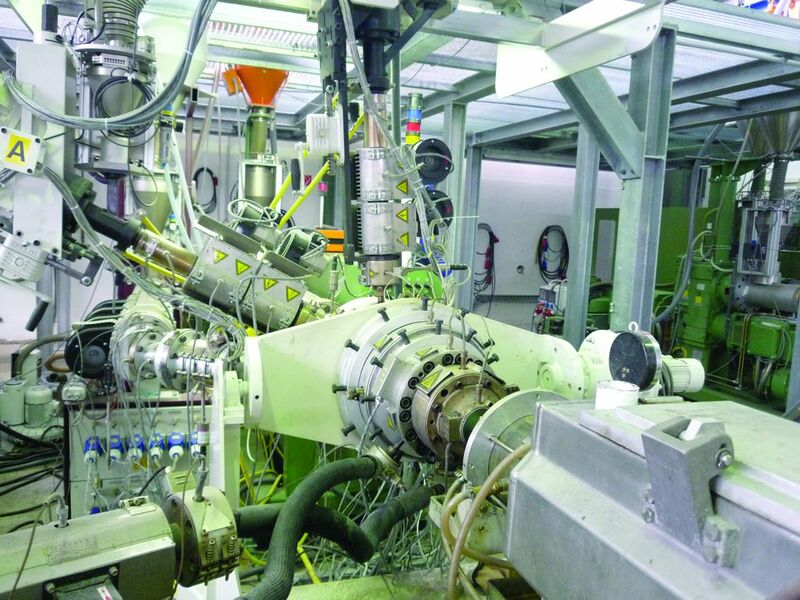 For the Middle Eastern growth markets in particular, Bänninger built its own production plant in Dubai in 2007, which has also been laid out for four extrusion lines. All extrusion lines at Bänninger have been supplied by battenfeld-cincinnati and are optimally geared to the requirements of PP-R pipe production. Single-screw extruders of various sizes are used, which, thanks to maximum wear resistance of the barrels with grooved feed zones and the barrier screws with special, customized screw geometries, are extremely durable even when processing glass fiber reinforced materials. Another vital component of every extrusion line is its special helix WPO pipe die with a multi-layer spiral mandrel distributor. All surfaces which come into contact with the product are provided with a special coating to minimize wear and prevent damage to the flow areas. Like all dies from battenfeld-cincinnati, the helix WPO spiral mandrel distributor also ensures high throughput, exact wall thickness distribution and a long service life thanks to low dwell times of the melt in the die. Dimensioning of the flow channels has already been designed for a number of years with the help of a proven flow simulation software available in-house. This enables optimal melt flow conditions with minimal loss of pressure.